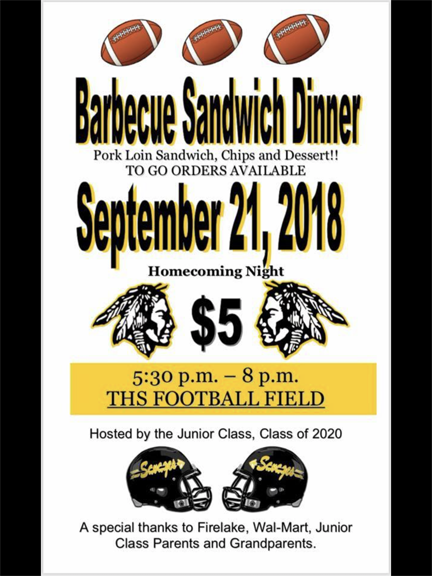 Come rain or come shine sports fans will be able to enjoy a pregame barbecue sandwich dinner on homecoming night September 21. The dinner, which is an annual event offered by the incoming junior class will be from 5 - 7 pm in the Alumni Center. The meal includes an extra large barbecue sandwich, chips and dessert for $5. Sponsors are urging everyone to arrive early to make sure you are served before 6:55 pm homecoming coronation ceremonies. Food sponsors include Firelake Discount Foods, Wal Mart and parents and grandparents of junior class members. All proceeds of the event are used to help cover start up expenses for prom which is hosted by the junior class in early May 2019.